Here at Mytee Products, we sell all kinds of truck tarps. We have steel and lumber tarps for the most common flatbed jobs. We also have smoke tarps, machinery tarps, and even mesh tarps that can be used for a lot of different applications. The secret is choosing the right tarp for the job at hand. Note that the various tarps we sell have a multitude of uses. All our tarps can be divided into one of two categories: cargo protection and cargo control. Despite what you may have heard, they are not the same thing. Trying to use a tarp as a cargo control tool when it is not intended to be used as such can lead to big problems. The federal government along with all 50 states have regulations in place requiring every motorist, regardless of the vehicle being driven, to properly secure any cargo that could otherwise dislodge and fall from the vehicle. This obviously applies to truck drivers. Flatbed truckers are required by law to secure not only their loads, but also any equipment and supplies they normally carry on their trailers for work use. Cargo must be controlled by appropriate means. Let’s say you’re hauling a load of pipe, for example. The pipe has to be secured in place using webbing straps. In most cases, wooden frames are used to stack multiple layers of pipes while preventing them from shifting. It would be unsafe and illegal to attempt to secure a load of pipe using tarps alone. On the other hand, let’s say you are driving a dump truck full of crushed stone. The dump itself contains the stone on four sides. You would deploy a tarp over the top to keep any of the material from flying off during transport. In this case, your tarp is being used as a cargo control tool. The line of distinction between cargo control and protection might be a fine one, but it is an important one to the flatbed trucker. Getting back to that load of pipe for a minute, it is already secured with wooden blocks and straps. So why the tarp? To protect the pipe from the elements and road debris. It is not uncommon for shippers to demand loads be covered by tarps during transport. They have a lot of money invested in the products they are shipping, and they expect those products to be protected. That’s why we sell so many kinds of tarps. Steel, lumber, and smoke tarps are not intended as cargo control tools. They are made for cargo protection. One last thing we want to address in this post is the use of mesh tarps in trucking. Mesh tarps are typically used for providing shade and privacy, but they are also invaluable for certain kinds of loads. That same dump truck driver who uses a blue utility tarp to keep aggregate in place might choose a lighter mesh tarp instead. Mesh tarps are also ideal for transporting roll-off dumpsters and yard waste. Keep in mind that waste haulers also have to prevent their loads from dislodging and flying off during transport. Yet because they have nothing valuable to protect, they can use lighter and more easily deployed mesh tarps rather than having to use their heavier counterparts. Every tarp we sell has a purpose. We stock so many because we have come to realize that truckers like choices. The more variety we can offer, the better we are able to help truckers do their jobs. 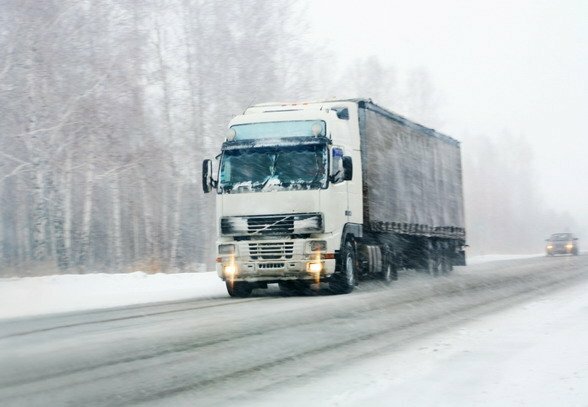 Every truck driver is familiar with the principle of inventorying cargo control supplies in advance of rougher winter weather. You need to know what you have so you know what to buy to be ready for the coming wind, snow, and sleet of winter. Yet the stormy summer of 2017 has been a reminder that there is another important reason to inventory your cargo control equipment and supplies: insurance claims. Whether you are an owner-operator or work for a carrier, cargo control equipment and supplies are considered part of the business to which they belong. As such, any losses relating to things like tarps and toolboxes are subject to insurance claims. The problem is that you cannot claim what you do not know you have. Furthermore, you can only make claims based on events and subsequent damage as outlined in your policy. You may have pieces in your inventory that are already suffering from minor wear or damage; they may not be eligible for an insurance claim should that wear or damage lead to a catastrophic failure during a storm. The one side of the insurance inventory coin dictates that you need to know exactly what you have on board at any given time. So, create a running inventory of everything you own. We are talking tarps, ratchet straps, ratchets and binders, corner and edge protectors, bungee straps, blocks, chains, and everything else you use for cargo control. Where tarps are concerned, it is important to distinguish exactly what kinds of tarps you have. You may have a variety that includes steel, lumber, and smoke tarps. You may have a larger number of machinery tarps than anything else; that would be noted in your inventory. Binders are another item that you may possess in different variations. Be sure to detail every binder in your box according to type. And while you’re at it, make sure to inventory your hand tools as well. They can be claimed if they are lost in an accident or storm. Taking inventory for the purpose of determining the condition of your cargo control supplies is important for a couple of reasons. First is the issue explained earlier in this post: you may not be able to claim a piece of equipment that was already showing signs of wear or damage prior to the incident in question. In fact, if the failure of such a piece of equipment contributed to a loss of cargo, that cargo may not be fully covered either. The second reason condition is important has to do with the kind of insurance coverage you have. Your policy might offer to pay the replacement value of lost cargo control supplies, or it may pay the actual value. Replacement value is the amount of money it would take to replace an item at its current retail price. Actual value is the is real value of an item based on its age, condition, etc. Actual value dictates that things like tarps and ratchet straps are worth less over time. That is not necessarily good or bad, but it is further motivation to make sure all your cargo control supplies are in good working condition. While you are conducting an inventory, you may discover that you are short on one or two items. We have you covered here at Mytee Products. You will find everything you need for safe and efficient cargo control in our online store. American truck drivers hauling flatbeds in Canada during October and November should pay close attention to their trailers and cargo control techniques. Canadian officials are preparing to launch their annual falls blitz, with a special emphasis on flatbed trailers. Although the campaign targets shippers and receivers instead of truckers, some drivers could incidentally be caught up in the blitz if they do not secure cargo properly. The Ontario Ministry of Labor conducts a falls blitz every year in order to improve safety relating to slips, trips, and falls. They look at ladders and other equipment used in mining, construction, healthcare, and industry. This year, the Ontario Trucking Alliance (OTA) has asked the Ministry to pay special attention to flatbed trailers and truck safety. The OTA and Canadian Trucking Alliance (CTA) are especially concerned about safety when loading and unloading flatbeds. They say improper cargo control procedures can lead to loads falling on vulnerable drivers. They say that the risk of injury and death among drivers is unnecessarily high. Also at issue are the many things outside the control of truck drivers. Examples include shipper and receiver ground maintenance, lighting, and tarping policies. For example, the CTA says it is common for shippers to not allow truck drivers to apply tarps in their yards. This forces drivers onto the roads where they have to tarp while worrying about traffic. While the trucking industry portion of Canada’s falls blitz focuses mainly on shippers and receivers, truck drivers still have that ever-important responsibility of making sure cargo is properly secured. Regardless of what happens in the shipping yard, a driver is ultimately responsible for his or her cargo once the truck leaves the yard. That does not change regardless of any action shippers and receivers fail to take to improve safety. As a flatbed driver yourself, you know the importance of sound cargo control practices. You are aware that the federal government requires you to properly secure all cargo prior to departure, and to ensure that said cargo remains secure throughout your journey. You also know there are right and wrong ways to use everything from chains to ratchet straps to tarps. If you are planning to travel into Canada over the next couple of months, we encourage you to take extra precautions with your flatbed cargo. Once the falls blitz is over, continue to be just as diligent with every load you carry. It only takes one momentary lapse of carelessness to create a dangerous situation. As a retailer of cargo control equipment, Mytee Products has everything you need to travel safely. Our inventory begins with basic cargo control supplies like straps and chains. But we do not stop there. We also carry corner and edge protectors, bungee straps, load bars, E-track, and more. In the tarp department we have everything you need to cover a variety of loads. Coil, lumber, steel, and smoke tarps are just the beginning. We also carry hay tarps for farmers and mesh tarps for construction companies, landscapers, and even homeowners. Earlier this year, American truckers were subjected to the annual international road check enforcement blitz. Interestingly enough, the 2017 event focused heavily on cargo control pertaining to flatbed loads. Is it a coincidence that the Canadian blitz is also taking a serious look at flatbeds? Maybe, and maybe not. Either way though, do yourself and the industry a favor by being extra cautious with cargo. Give cargo control the attention it deserves and you will have nothing to worry about. It is fascinating to dig around in trucker forums to see what flatbed drivers say about smoke tarps. This is one area with lots of differing opinions, that’s for sure. Truckers generally agree that smoke tarps are easy to use and cheap to buy. What they do not tend to agree on is whether or not to use smoke tarps for particular kinds of loads. From our perspective, it comes down to this: use smoke tarps when your customers want and or need them. A good case in point is a load of PCV pipe. Most receivers are incredibly picky about the condition of the pipe when it arrives in the freight yard. The last thing your customer wants is a load of pipe covered in soot from your exhaust stacks. If it gets inside the pipes, that’s even worse. This is why PVC pipe almost always requires the use of some kind of smoke tarp, be it a flat tarp or a fitted one. Nearly every flatbed trucker has been dispatched to pick up a load deemed a ‘must tarp’ load, only to see the receiver take the load and leave it out in the yard fully exposed. In such cases, it is not uncommon for drivers to blame receivers for unnecessarily requiring smoke tarps. Yet often, the problem lies with dispatchers or the trucking companies themselves. It is easy for a trucking company sales associate to promise to tarp every load, whether it needs it or not, at no additional charge. This is a sales tactic to gain new customers. Experienced truckers know enough to check with the shipper and receiver prior to accepting a ‘must tarp’ load to see if it really does need to be tarped. If it does, the driver should tarp it without question. If not, it is up to the preferences of the driver. Smoke tarps come in two basic styles: fitted and flat. Fitted smoke tarps are often known as nose tarps because they fit over the front nose of the load to guarantee all of the necessary surface area is covered. Unfortunately, fitted smoke tarps do not always work well with loads that are not perfectly rectangular, square, or circular. Irregular loads tend to be better protected with flat tarps secured with bungee cords or straps. A typical flat smoke tarp is a 10 x 12 or 12 x 12 piece of vinyl. Some truck drivers recommend going to your local big box store and purchasing one or two cheap blue tarps for use as smoke tarps; we do not recommend this practice at all. Why? Because blue tarps are not meant to withstand the punishment of the open road. They fall apart very quickly and, in the end, cost more money by having to be replaced so often. Mytee Products carries a 10 x 12 heavy-duty smoke tarp made with 18-ounce vinyl. It is rugged enough to withstand a good deal of punishment and sufficiently durable to last for years. If you regularly transport loads requiring smoke tarps, we highly recommend this product. In the end, drivers use smoke tarps because the load they are driving requires it and that’s what their customers want. If that’s what it takes to keep the customer happy, that is what you do. Happy customers mean repeat trips and additional business. It is just that simple.